CalChamber's 2019 poster reflects increases to the minimum wage effective July 1, 2018. * The $13.25/hour rate applies to employers with 26 or more employees; $12.00/hour rate applies to employers with 25 or fewer employees. All employers with employees who perform at least two hours of work in a particular workweek within the City of Malibu. 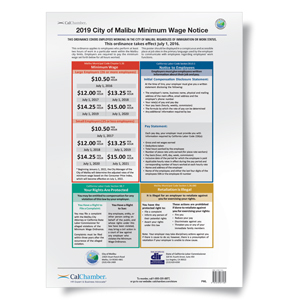 CalChamber’s 11” x 17” Malibu Minimum Wage poster in English contains the official notice with Malibu's current minimum wage. It is recommended that every employer post the City of Malibu's minimum wage notice in a conspicuous and accessible place at job sites. Employers should post this notice in in the primary language used by the employer to communicate with employees regarding employees' work functions. *If you currently use the July 2018 poster from CalChamber, you can continue to use it until June 30, 2019. The minimum wage rate will increase on July 1, 2019, at which time a new poster may be recommended.